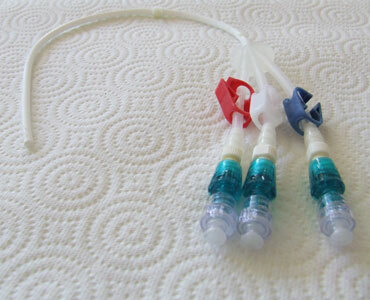 This is the Neostar triple lumen catheter I had at Wake Forest last year (in 2006). It was noticeably heavier than the hickman double lumen. I had this thing in a plastic bag for almost a year. It had never been taken out and cleaned since it was removed, so you can imagine how gunky it was. I tried to flush it with bleach and water, which wouldn’t go through due to a clog. The Hickman (Bard) catheter I had at Duke during the summer can be found here. I think it’s time for a new blog theme. I’ll be on the lookout. Expect a change soon! Hi Beth, I noticed you filed this under Stem Cell Transplant. I’d be very interested to know if you followed up on this subject or have found anything promising?